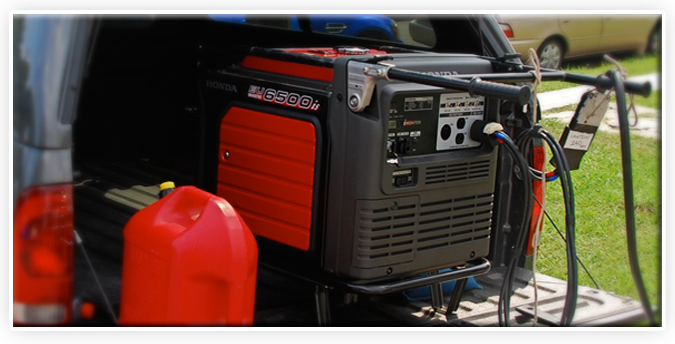 The EU series Honda generator represents the leading edge of portable power technology. Each unit has an Oil Alert that shuts down the engine if the oil level drops below the operational level. When in use the Eco-throttle provides additional fuel economy by allowing the engine to run only as fast as needed to satisfy the given load. All generators are equipped with circuit breakers, USDA-qualified spark arrestor mufflers and automatic voltage regulators. The EU series is the quietest generator in its class and will power a HMI without flicker. For safety reasons generators are delivered with a full tank of gas and an empty gas can that must be filled by client, if used. The Lighting Zone is your one stop shop for portable power.